Visions of the city as it might be. This rapidly developing area includes the city’s northern train station - a major hub - and is bordered by the Suzhou river, one of Shanghai’s great neglected assets. 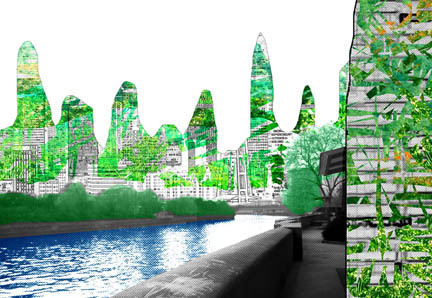 This scheme seeks to complete the district by reclaiming its waterfront; by retaining the vanishing small-scale commercial character of its historic fabric; by providing for a rich mix of uses; by adding a thick layer of green and sustainable interven­tions; by specifying the forms and densities of new buildings and street-scapes; and by developing a rich texture of public spaces.